Analysis: LaFell ruptured the Achilles tendon in his left leg last November and will become an unrestricted free agent at the end of the league year. While the 32-year-old likely won't be healthy again until June or July given the 6-to-9-month recovery timeline that typically accompanies Achilles injuries, LaFell seems to have a decent shot of being ready to go by the time training camps begin. Analysis: This move is simply a formality after LaFell was diagnosed with a season-ending Achilles rupture earlier Monday. With both Jordy Nelson (knee) and Martavis Bryant (knee) also banged up at the moment, the Raiders may need to rely heavily on tight end Jared Cook and receivers Seth Roberts and Marcell Ateman to fuel the passing game in the short term. Analysis: If so, the Raiders' wideout corps -- already dealing with knee injuries to both Jordy Nelson and Martavis Bryant -- will be further taxed. The team's other options at the position are currently Seth Roberts, Marcell Ateman, Dwayne Harris (chest) and Saeed Blacknall, hardly a fantasy 'who's who'. Analysis: Per Michael Gehlken of the Las Vegas Review-Journal, LaFell wasn't able to apply pressure onto his left leg, which isn't a good sign as it pertains to the wideout's Achilles. Prior to his exit, LaFell caught two of his three targets for 29 yards and a TD. With Jordy Nelson and Martavis Bryant already out Sunday, the Raiders' wideout corps is now down to Marcell Ateman, Seth Roberts, Dwayne Harris and Saeed Blacknall. Analysis: LaFell has caught at least three passes in as many contests since the Raiders' Week 7 bye, but could solidify himself as the No. 1 option at receiver if Nelson (knee) is forced to miss some time. Additionally, Bryant appears to be prepared for an extended absence as the Raiders may need to bring in another pass catcher from the free-agent pool. LaFell's underwhelming competition at wide receiver includes Seth Roberts, Marcell Ateman and Dwayne Harris moving forward. LaFell caught four of six passing attempts for 47 yards in Sunday's 20-6 loss to the Chargers. LaFell caught all three of his targets for a total of 20 receiving yards in Thursday's 34-3 loss to the 49ers. Analysis: LaFell led the Raiders' receiving corps in snaps played, but failed to translate this feat into an efficient output as he averaged just 6.7 yards per catch. He's clearly risen above Martavis Bryant in the pecking order at wide receiver, so expect LaFell to draw the start once again Week 10 against the Chargers. LaFell played 92 percent of snaps on offense in Sunday's 42-28 loss to Indianapolis, catching three of four targets for 39 yards and a touchdown. Analysis: LaFell unexpectedly replaced Amari Cooper in the starting lineup while Martavis Bryant played just seven snaps and failed to draw a single target. It's only fair to expect the same alignment during Thursday's game in San Francisco, though the Raiders would be wise to eventually take a closer look at Bryant in a regular role. LaFell (back) was a full participant in Thursday's practice. 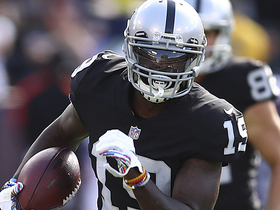 Analysis: LaFell was sidelined during the Raiders' season-opening loss to the Rams and limited in practice to begin the week due to a back issue. The veteran seems healthy heading into Sunday's matchup against the Broncos, but he stands to see limited offensive snaps even if he suits up. LaFell was limited in Wednesday's practice due to a back issue, Matt Schneidman of The San Jose Mercury News reports. Analysis: LaFell was inactive for the Raiders' season-opening loss to the Rams in what was deemed a coach's decision. 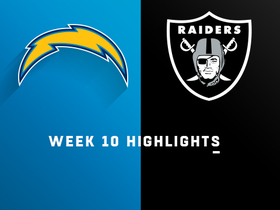 The wideout has since had more time to get up to speed with the Raiders' playbook after signing with the team Sept. 3, but it now appears that the back injury could impact his availability for the Week 2 matchup with the Broncos. If LaFell is cleared to make his season debut, he would likely be limited to a depth role and see minimal snaps on offense. LaFell (coach's decision) is inactive for Monday's game against the Rams. Analysis: LaFell -- who was signed on Sept. 3 -- will have to wait a little longer to make his Raiders debut. The former Bengals wideout is expected to battle with Seth Roberts for the team's No. 3 receiver job once he gets acclimated with the offense. 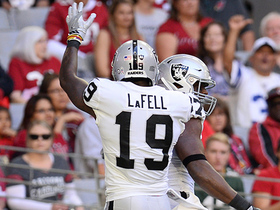 The Raiders have signed LaFell, the team's official site reports. 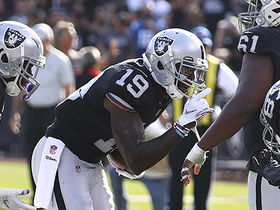 Analysis: With Martavis Bryant having been cut loose this past weekend, the Raiders were looking for added depth behind top wideouts Amari Cooper and Jordy Nelson. Enter LaFell, who has a chance to supplant Seth Roberts as the team's No. 3 wideout once he gets up to speed with the Oakland offense. Neither of those two are high-upside fantasy options at this stage, but they do merit a look by those in deep leagues scrambling to replace Bryant. LaFell will be granted his release by the Bengals, Mike Garafolo of NFL Network reports. Bengals head coach Marvin Lewis hinted that LaFell isn't a lock to make the 53-man roster, Katherine Terrell of ESPN.com reports. "Brandon LaFell has done a nice job," Lewis said. "He feels the heat. That's a competitive group of wide receivers. So we can only keep so many of them. They're going to be competitive that way and that's a good thing." LaFell will collect a $1 million roster bonus, Katherine Terrell of ESPN.com reports. 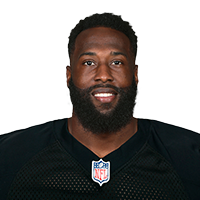 LaFell may emerge as a candidate for release at some point this offseason, Paul Dehner Jr. of The Cincinnati Enquirer reports. LaFell had two catches for 35 yards on four targets in the Bengals' Week 17 win over the Ravens. He finished the season with 52 catches for 548 yards and three touchdowns. Analysis: Despite the Bengals spending a first-round draft pick on a wide receiver (John Ross) this year and a second-round pick on Tyler Boyd last year, LaFell remained the Bengals' No. 2 option in the passing game, albeit with diminishing returns. His yards per reception dropped a full three yards, from 13.5 to 10.5, and his touchdowns were cut in half. If he sticks around next year, look for his reps to be cut in favor of Boyd and Ross. LaFell caught two of six targets for 53 yards in Sunday's 34-7 loss to the Vikings. 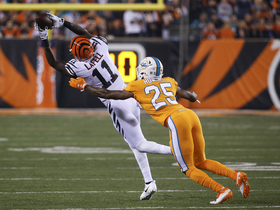 Analysis: LaFell's team-leading receiving total came mostly courtesy of a 45-yard catch. Little went right for Cincinnati's offense besides that play, as starting quarterback Andy Dalton threw for only 113 yards and backup AJ McCarron added just 19 more after taking over in the fourth quarter. LaFell caught three of six pass attempts for 24 yards and a touchdown in Sunday's 33-7 loss to the Bears. Analysis: The 14-yard touchdown catch capped off the Bengals' only scoring drive of the day and gave them the lead briefly. But the Bears' defense smothered A.J. Green and LaFell the rest of the way, leaving the 31-year-old with his worst yardage total since Week 4. With Green likely to draw the attention of Xavier Rhodes in Week 15 at Minnesota, LaFell should see a few more open looks. 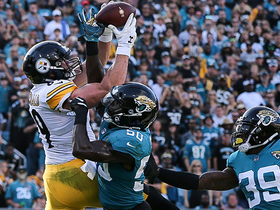 LaFell made four catches for 55 yards on seven targets in Monday's 23-20 loss to the Steelers. Analysis: LaFell continues to rank as quarterback Andy Dalton's second option in the passing game. The veteran receiver doesn't look to be at risk of losing that status over the Bengals' final four games, especially now that John Ross (shoulder) has been shut down for the season. LaFell (knee) returned to a full practice Thursday, Nate Ulrich of the Akron Beacon Journal reports. Analysis: LaFell is thus slated to play Sunday against the 0-10 Browns, who have surrendered 20 passing TDs to date. Only the Broncos (22), Texans (22) and Titans (21) have allowed more. That said, the veteran wideout's fantasy ceiling isn't especially high, considering he's averaging 3.4 catches for 34 yards through 10 games, to go along with two TDs. LaFell (knee) was limited at Wednesday's practice. LaFell (knee) is listed as active Sunday at Denver. Analysis: Building from no practice to all drills by week's end, LaFell's availability wasn't really in up in the air, despite his listing as questionable for the contest. He'll thus take aim at a Broncos defense that has allowed three touchdowns and 13.3 YPC to wideouts during their current five-game losing streak. Though he was deemed a full participant in Friday's walk-through, LaFell (knee) is listed as questionable for Sunday's game against the Broncos. Analysis: Confirmation of the veteran wideout's Week 11 status will arrive in advance of the 4:25 p.m. EDT kickoff Sunday. The fact that LaFell was listed as a full participant Friday, however, bodes well for his chances of suiting up this weekend, after he was on the field for 48 of the Bengals' 51 offensive snaps in their Week 10 loss to the Titans. During the contest, LaFell caught six of his team-high 10 targets for 95 yards and a touchdown. The Bengals listed LaFell (knee) as a limited participant at Thursday's practice, Paul Dehner Jr. of The Cincinnati Enquirer reports. Analysis: It amounts to a step forward for LaFell, who was held out of Wednesday's session entirely while managing the knee issue. If LaFell is upgraded to a full participant for Friday's practice, it's unlikely that he'll carry an injury designation heading into Sunday's game against the Broncos. LaFell turned in his best outing of the season in the Bengals' Week 10 loss to the Titans, racking up 95 yards and a touchdown on six receptions. LaFell (knee) did not practice Wednesday, Paul Dehner Jr. of The Cincinnati Enquirer reports. Analysis: LaFell was on the field for 48 of the Bengals' 51 snaps on offense in Week 10's to the Titans, hauling in six of his team-high 10 targets for 95 yards and a TD in the process. With no reported setbacks since then, there's a solid chance that the veteran wideout's absence Wednesday is maintenance-related, a notion that would be confirmed by his return to practice, in any capacity, Thursday. LaFell caught six of 10 targets for 95 yards and a touchdown in Sunday's 24-20 loss to Tennessee. Analysis: LaFell was featured early, hauling in three catches for 49 yards on the first two drives, including a 37-yard touchdown to cap the second one. When the dust settled, Cincinnati's No. 2 receiver emerged with season highs in catches and yards along with just his second receiving score of the season. While LaFell's capable of the occasional big game, A.J. Green is the only consistent weapon in this passing game. LaFell (hamstring) does not carry a Week 10 injury designation in advance of Sunday's game against the Titans after practicing fully Friday. Analysis: LaFell continues to log plenty of snaps in the Bengals offense, but the veteran wideout's production this season hasn't generated big numbers. He's only scored one TD in eight games, and 44 receiving yards represents his high-water mark in 2017. LaFell (hamstring) was limited at practice Wednesday, Katherine Terrell of ESPN.com reports. Analysis: LaFell didn't practice at all last Wednesday before returning to a limited session Thursday. With no setbacks reported over the course of his 38 (out of a possible 39) snaps on offense in this past Sunday's 23-7 loss to the Jaguars, we'll assume that LaFell being limited Wednesday was precautionary in nature. LaFell caught both of his targets for 28 yards in Sunday's 23-7 loss to Jacksonville. Updating an earlier report, LaFell (hamstring) doesn't carry an injury designation heading into Sunday's game against the Jaguars. Analysis: The Bengals' official site had erroneously listed LaFell as questionable for the Week 9 matchup, even though the wideout cleared up any concern regarding his status by practicing fully Thursday and Friday. LaFell should see a full snap load Sunday while filling his usual role as the starting receiver opposite top target A.J. Green. LaFell (hamstring) is listed as questionable for Sunday's game against the Jaguars. Analysis: LaFell put in full practices Thursday and Friday, so despite his questionable designation, the Bengals probably don't expect him to miss the Week 9 contest. The veteran wideout has enjoyed a decent-sized spike in targets the last three weeks, but has only 13 catches, 104 receiving yards and a touchdown to show for it. He doesn't warrant ownership in most shallow fantasy settings. LaFell (hamstring) practiced fully Thursday, Katherine Terrell of ESPN.com reports. Analysis: LaFell is thus on track to play Sunday at Jacksonville and start opposite star wideout A.J. Green. LaFell's Week 9 fantasy upside appears limited though by a tough matchup at hand. To date, the Jaguars have allowed a league-low average of 161.7 passing yards per game. LaFell (hamstring) is taking part in practice Thursday, Katherine Terrell of ESPN.com reports. Analysis: The Bengals will reveal after the session concludes whether LaFell was a limited or full participant, but either way, it's a positive sign after the hamstring injury sidelined him Wednesday. Though the Bengals returned John Ross (knee) from injury in the Week 8 win over the Colts, he was targeted just once in the contest and doesn't appear ready to take on a larger role in the offense, leaving LaFell fairly secure at the moment in his starting role at wideout alongside A.J. Green. LaFell (hamstring) did not practice Wednesday. Analysis: LaFell was on the field for 91 percent of the Bengals' snaps on offense in Week 8, but his status is now worth tracking as this weekend's game against the Jaguars approaches. 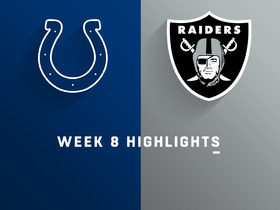 The veteran wideout logged four catches (on five targets) for 44 yards in this past Sunday's 24-23 overtime win over the Colts. Oakland Raiders wide receiver Brandon LaFell leaps for a 24-yard gain. 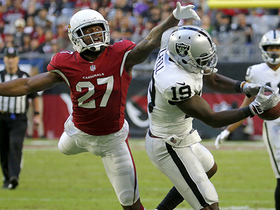 Oakland Raiders wide receiver Brandon LaFell's first catch as Raider goes for 15 yards. 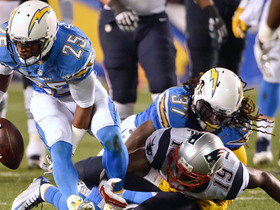 New England Patriots wide receiver Brandon LaFell's fumble is recovered by San Diego Chargers safety Darrell Stuckey. 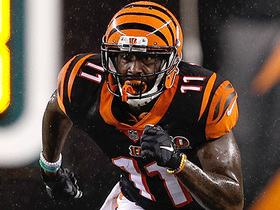 NFL Network Insider Ian Rapoport reports on the Cincinnati Bengals release of wide receiver Brandon LaFell.